These are great as a replacement for peanuts to have with a drink. They’re much more healthy than many snacks designed to go with a beer of glass of wine. You can use any spices you like but I found it easiest to use stallholder Besaha’s Chermoula spice blend. I wanted them quite spicy so added extra cayenne pepper. You can use only one spice or make your own combination of favourites. Preheat the oven to 180°C. 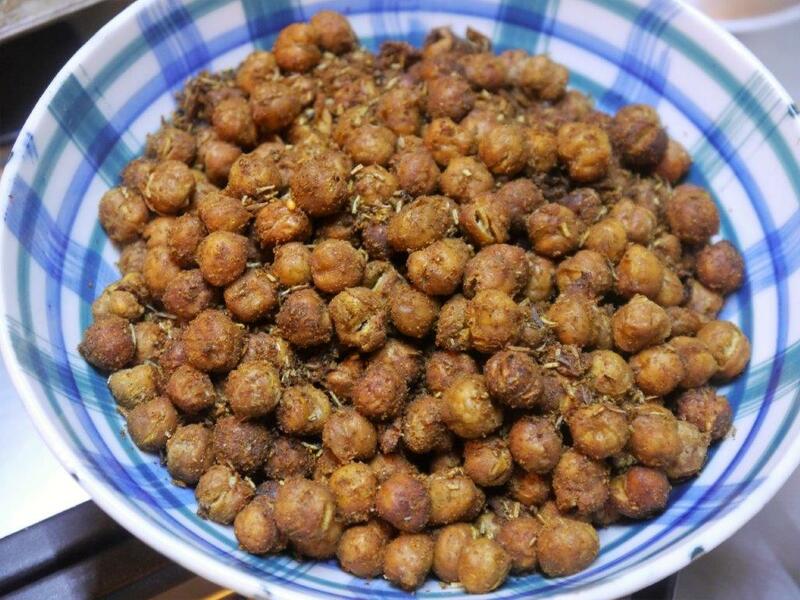 Pat the chickpeas as dry as you can with paper towels and place in a bowl. Drizzle with a little olive oil and add the spices, dried herbs and salt. Mix together. Spread the chickpeas on a baking tray lined with baking paper. Place in the oven for 20-30 minutes or until the chickpeas are starting to brown. To test, take one or two from the oven and leave to cool for a minute. If they’re ready they’ll go crunchy as they cool.